I see this text consisting of a heart and appendages. The heart = the funeral. The appendages = the memories (of what it’s like to be a kid & of previous dating experiences) – plus the experiences at the roadside attractions. Oddly, the heart (the funeral section) seemed to be of tangential importance. What seemed to hold the most significance, for me anyways, were the appendages. But perhaps that observation says more about me as a reader – and what I see as a tension between reality and imagination – than about the text itself. As a reader, I generally tend to dislike conventional realism because I find it uninteresting to read a transcript of a situation that could feasibly occur in the ordinary reality in which I live: in the case of A Jello Horse it would be what I am calling the heart — the transcript of driving to a house party, playing pinball, going to a funeral, going to a health clinic, etc. And to be honest, I can’t really understand why other people don’t feel the same negative reaction to this kind of realism. I mean, we already share this ordinary existence, why would I want someone to tell me about their version of it? That would be like someone giving me a running commentary while I’m watching a Lakers game. It’s like: dude, I’m watching it with you, I don’t need you to tell me your version of it – I already have my version, which I will always value greater than anyone else’s version. What I don’t have is whatever strange imaginary things other people hide in their heads, which is one of the primary reasons I turn to literature in the first place. So what I find most interesting is when a writer writes something unfeasible slash unordinary, be it linguistically, conceptually, formally, etc. And I think Simmons accomplishes this triumphantly in the sections I have identified as appendages. In the unfeasibility/unordinariness of The House of 2000 Telephones, where every phone works and has a separate line. In the unfeasibility/unordinariness of the Jackalope Village, and the curious conversation the narrator holds with the wife of the owner. In the unfeasibility/unordinariness of the childhood dreamscapes. These things are really superlative, really interesting, imaginative, creative, and engaging. What I find less interesting, imaginative, creative, and engaging is the transcript of ordinary reality at the heart of the text. So this is what I’m thinking when I finish reading A Jello Horse: the heart is eh and the appendages are sweet. I contemplate writing down my initial reactions but decide to think about it for a while, give the book a chance to sit in my brain. And now I’m wondering about the relationship between the heart and the appendages. Do they need one another? Would the book be more satisfying without the heart, since I’ve indicated my affinity for the appendages. My answer is: I’m not sure. Part of me wants to say that the realism gets in the way or drags the piece down. But then part of me wants to say that the realism gives the work an anchor from which the appendages can bloom: i.e. maybe craziness without an anchor might not always be sufficient. This gets me thinking more about the heart. It’s easy for me to locate the appendages as the fun and interesting aspects of the text, sort of like how you can locate the fun and interesting aspects of a potential lover. But sooner or later, if that lover is going to become anything more than a lover, there needs to be something substantive. Maybe this is the role of realism in A Jello Horse. Maybe the text needs that anchor, that substance, that realism, to give it a kind of gravity it would not possess if all were appendage, if all were unfeasible, if all were imaginary. I’ve decided to reconsider my initial reaction. I think the heart is important and vital to the complexity of the text and without it something important would be missing. I still don’t think the heart is the most interesting part of the text, but I think the fact of it being there actually works to make the appendages as interesting as they are. And in the case of A Jello Horse, I have to commend the counterbalance for resisting the contemporary urge toward hipster irony. That is one really strong aspect of the realism in this text: it feels honest and sincere. For that I am ever thankful. None of the characters are trying to be cool. None of the characters are phony (as Holden Caulfield would say). They are just people. Not remarkably interesting people, but then again so few real people are remarkably interesting. One final thing I wanted to mention was the choice of using the second person. I think the most productive thing a critic can do is try and explain how the text is working without judging its effectiveness, on the basis that if the critic can explain the mechanisms clearly then a potential reader can deduce the efficacy for themselves. For my part, I see the second person working as a way for the narrator to distance himself from the story. Maybe it’s a way of saying “I” without admitting culpability. Maybe it’s a way of being in the world without admitting that one is in the world. Or maybe, because of the reminiscent (nostalgic?) quality of the text, it is functioning as a tool of/for memory. By saying “You” the narrator can address a former version of himself. Like how if I were talking about the 21-year-old version of myself, which feels nothing like the 31-year-old version of myself, I would call that Chris “You” because he doesn’t feel anything like “I” feel. Maybe that’s it. Maybe it is a way of showing that the narrator is telling a tale that transpired many moons ago, to a version of himself far removed from the version who is actually typing the words. At any rate, I think the use of second person in this text is interesting and important and shouldn’t be dismissed as gimmicky. It’s not for nothing that he chose to use the second person. It’s not for nothing. 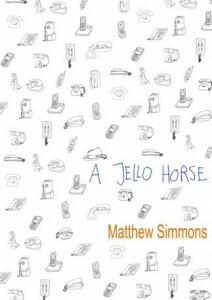 In the end, I appreciate the challenge Matthew Simmons presents: combining the feasible and unfeasible, the ordinary and the unordinary, reality and imagination; and I believe reading and thinking about A Jello Horse has pushed me toward becoming a better reader and thinker. — Christopher Higgs is the author of the chapbook ‘Colorless Green Ideas Sleep Furiously’ and edits the art blog Bright Stupid Confetti.